ST. GEORGE (AP) — Southern Utah's Brian Head Resort canceled its New Year's Eve fireworks show because of snowy weather. Brian Head spokesman Mark Wilder told The Spectrum of St. George that the resort's fireworks show and torchlight parade were canceled because of "blizzard" conditions. He says the snowy weather has been good for the ski resort but officials wanted to ensure the New Year's celebrations were safe. The area's low temperature was -11 degrees Fahrenheit Monday and the Utah Department of Transportation reported icy conditions on State Road 143 leading to the resort. Wilder says the resort plans to reschedule its fireworks show for President's Day weekend. Elsewhere around Utah, Tuesday's temperatures were expected to be close to typical nighttime lows for this time of year, National Weather Service officials said in a tweet. The Salt Lake International Airport recorded a temperature of 7 degrees after midnight. The coldest observed temperature there in 2018 was 12 degrees, the weather service said. Other low temperatures included Tooele at 1 degree Fahrenheit, Cedar City at 4 degrees and the Provo Municipal Airport at 8 degrees. Peter Sinks, northeast of Logan, hit -48 degrees, according to a tweet from meteorologist Timothy Wright. 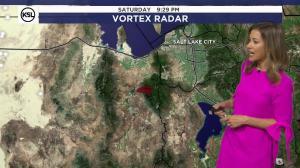 Get the complete forecast on the KSL weather page.